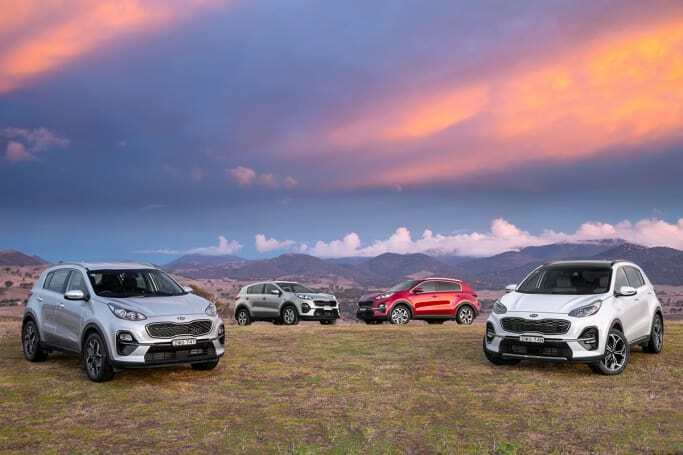 The Kia Sportage is a handsome, well-priced contender in a crowded mid-sized SUV market that includes the likes of the Mazda CX-5, Toyota's RAV4 and Hyundai's Tucson. 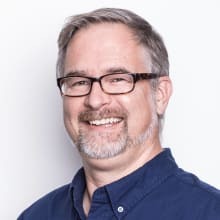 The latest generation has, however, been lacking in a key area since its launch in 2016. Has Kia sorted the oversight with this facelifted model? 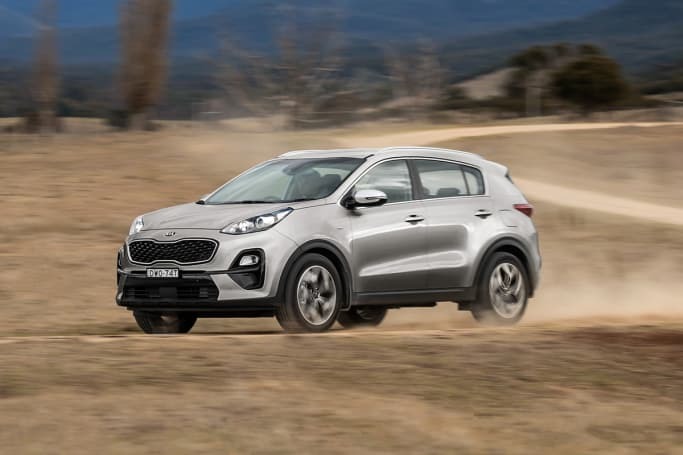 The Sportage has jumped in price across the board, thanks mainly to the addition of new standard driver aids like auto emergency braking (AEB) and lane keep assist. Previously, these systems were only available aboard the top-spec GT Line. Looking at all the Kia Sportage models, the entry level Si now costs $29,990 (up $1000) and its standard features include cloth seats, 17-inch alloys, reversing sensors and reversing camera (with moving guidelines), fog lights, automatic headlights, automatic wipers, dual-zone climate control air conditioning, a leather-wrapped steering wheel and gearshift, an updated 7.0-inch multimedia touch screen with Bluetooth and streaming, three 12-volt plugs and a USB port. You can access your iPhone or Android equivalent via Apple CarPlay and Android Auto, too. If you're looking for a particular colour, there are a few, including Clear White as standard, Steel Grey, Sparkling Silver, Fiery Red and Mercury Blue. A diesel version of the Si – complete with a new eight-speed auto and standard all-wheel-drive – will cost $35,390, an increase of $1400. The Si Premium adds satellite navigation, front parking sensors, LED running lights, 18-inch alloys, an 8.0-inch touchscreen infotainment system, DAB digital radio and JBL premium sound system with eight speakers. 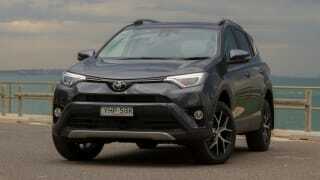 The petrol version has an RRP of $32,390 (up $1400) and the diesel is $37,690. There is a drive away price on the Si Premium of $31,990 and $37,390. If you ask nicely, you might also get a keener price on the other models in your price range. The SLi petrol will cost you $36,790 (up $2100) and adds gadgets like an auto dimming rear view mirror, front sensors, LED DRLs, extra chrome trim, LED rear lights, electric handbrake, auto up on passenger front window, a 4.2-inch TFT dash screen, sat nav and automatic wipers. Diesel adds $5400 for a new total of $42,190 (an increase of $2500). The price for the top of the range 2.4-litre Sportage GT-Line, meanwhile, is $44,790 (up $1300) or $47,690 (up $1700) in diesel form. It's well equipped, with leather seats, 19-inch alloys, AEB, lane departure warning, an automatic tailgate, keyless entry, auto lights and wipers, as well as gadgets like LED headlights and fog lamps, dual-zone climate control, GPS sat nav, vented and heated powered seats, a sunroof and park assist. The price for the top of the range 2.4-litre Sportage GT-Line is $44,790 or $47,690 in diesel form. If you're looking for a particular colour, there are a few, including Clear White as standard, Steel Grey, Sparkling Silver, Fiery Red and Mercury Blue, while Snow White Pearl and Cherry Black are exclusive to GT-Line. All colours except Clear White add $520 to the price. Looking for orange or gold like in previous generations of the Sportage? Can't help, I'm afraid. For the exterior, the front end has been lightly massaged with a new grille design. 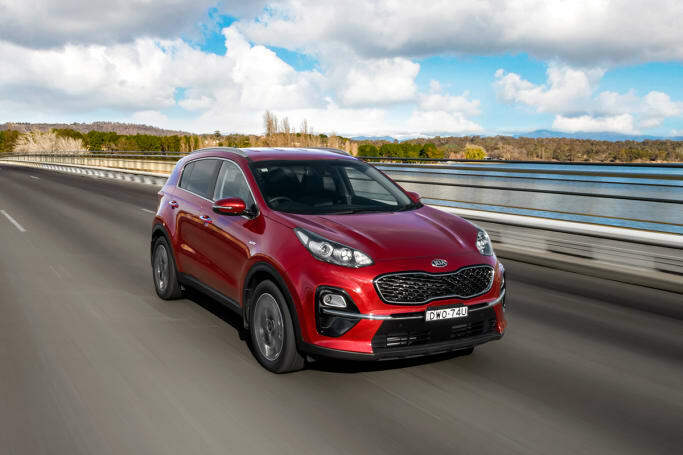 We're big fans of the Sportage's stylishly bold looks that are proportionate to its size, and thankfully Kia's designers haven't mucked about too much with an already good design. For the exterior, the front end has been lightly massaged with a new grille design, while the HID headlights on the GT-Line have been dropped in favour of a full LED cluster. The fog lamp apertures on the Si and Si Premium have also been redone with sharper lines for more masculine look or, as Kia says, a bit more menace. They also now score LED daytime running lamps across the lineup. 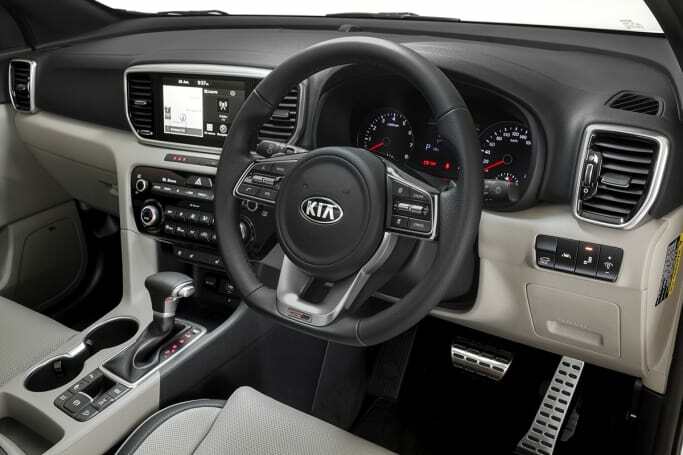 Interior wise, updated multimedia systems have been added across the range and the steering wheel has been redesigned. Out back, the tail-light arrays have been tweaked, while the lower bumper has also been tidied up to better match with the chrome trim, as well. The GT-Line's rear faux skid plate has been changed, too. New wheel designs have been added in all three sizes (17-, 18- and 19-inch in size) as well. Steel Grey is a new colour. Interior wise, photos will reveal nothing has changed from the 2016 facelift, save for the addition of updated multimedia systems across the range and redesigned steering wheel. Interior dimensions were increased when the PE model was launched in 2016. Again, there are no changes to the packaging of Kia's clever little mid-size SUV. If you ever idly wonder 'how many seats does a Kia Sportage have? ', the answer is just five. Storage spaces are plentiful and clever in the Sportage, with two cup holders in the centre console, room for larger bottles in all four doors, as well as a pair of cup holders in the centre rear armrest. Storage spaces are plentiful and clever in the Sportage. 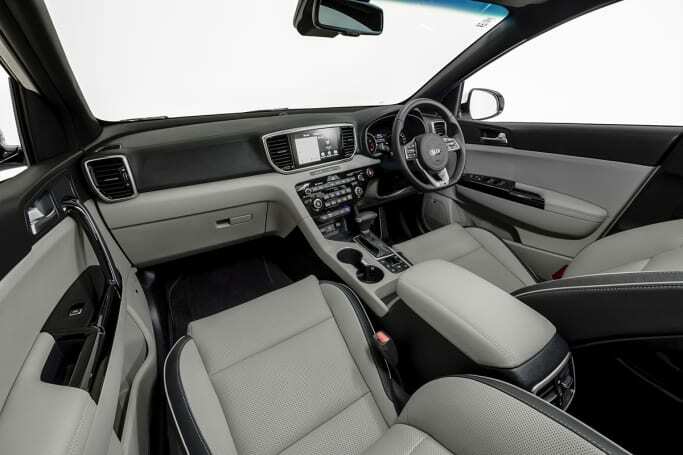 A pair of ISOFIX baby seat mounts are fitted to each of the rear outboard seats, but the centre rear sash belt is mounted in the ceiling, and it needs to be disconnected if you want to make the most of the large cargo space. It's a pain, to be honest, and it takes away from the car's otherwise good practicality. 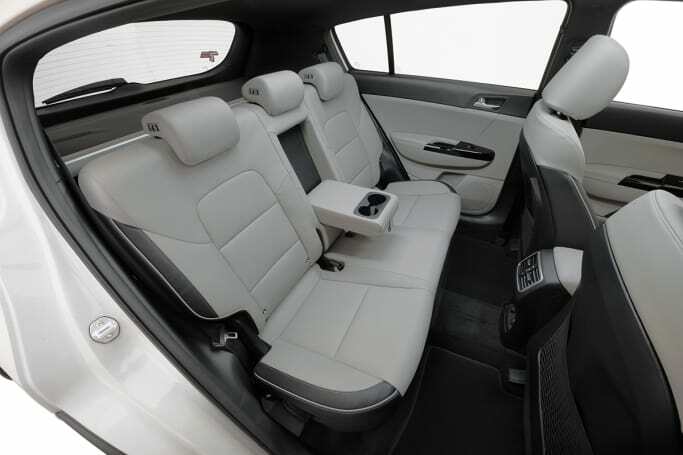 The 60/40 split rear seats – which offer plenty of rear legroom even with the front seats ratcheted back - can't be dropped via switches in the rear cargo area, but they do slap down quickly and firmly with the pull of a lever on the sides of the rear seats to increase luggage capacity. 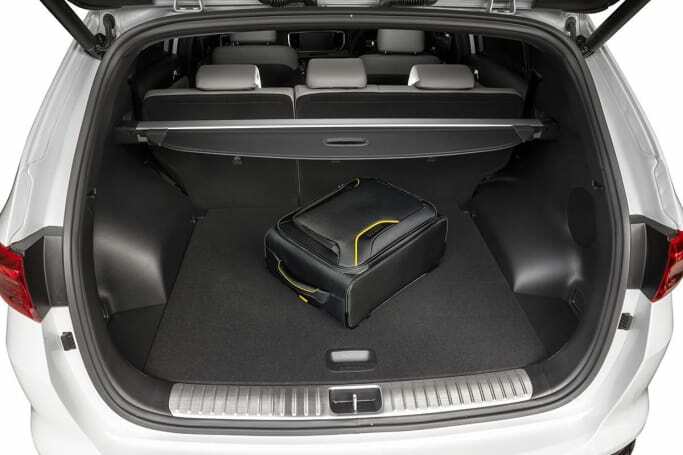 There is 466 litres of boot space with the seats up – more than the sales-leading Mazda CX-5 – and 1455 litres of boot size in the full-flat position. Boot space dimensions remain the same. Despite the Sportage being a medium SUV in size, it fits four adults easily, and three across the rear at a pinch. 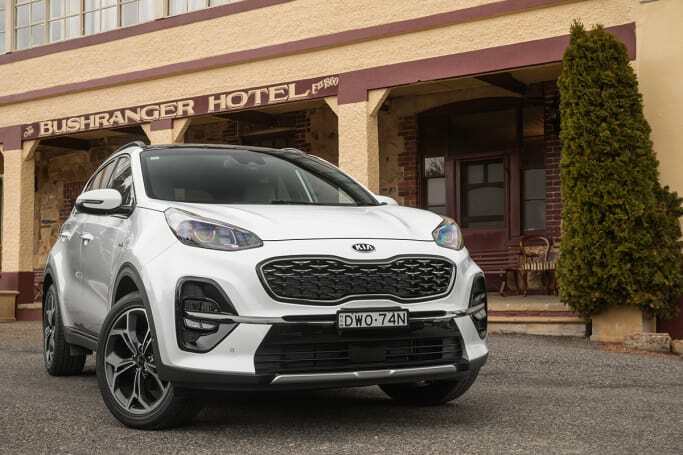 The base Sportage does miss out on a few items that are on the higher grade cars, like an electronic handbrake, while the top-shelf GT Line gets an inductive wireless phone charging tray (Qi). A cargo net and tie-down hooks can be found in the cargo area of the SLi and above models, and there's a full-sized spare underneath the boot floor on every model. There are also LED lights in the cabin throughout the range. Despite the Sportage being a medium SUV in size, it fits four adults easily, and three across the rear at a pinch. The driving position is slightly higher than expected, but it's still well suited to both short and tall drivers. There is 466 litres of boot space with the seats up and 1455 litres of boot size in the full-flat position. Controls for commonly-used systems, like the illumination controls for the dashboard, fall easily to hand, and aren't buried in the menu in the multimedia system. New multimedia systems feature throughout, with a larger 8.0-inch screen for all models except for the base Si (it gets a 7.0-inch screen, but no CD player – what, you haven't heard of an MP3 player? ), while all models can be teamed with smartphones via Apple CarPlay and Android Auto. There's also digital radio in the top spec car, along with smart adaptive cruise control. Kia has taken the opportunity to further tweak the ride and handling of the Sportage to better suit our roads. The steering gear ratio has very slightly changed, along with new bushes in the front MacPherson strut suspension and front sub-frame tweaks. The Sportage's German-made ZF Sachs dampers have been extensively reworked, as well, to give it a more comfortable ride. There is a little bit of difference in all three powertrains, too; there are lighter springs for the FWDs, heavier ones in the rear suspension for the AWD, and three unique different shock tunes for all three engines. The Sportage is built for a life around town, and the lighter, front-drive, petrol-powered cars are perfect for it. The 2.0-litre engine gets thrashy when acceleration is needed up hills, though, with the auto occasionally confused by which ratio to pick and hold. Despite its age, the engine is still a very smooth and tractable unit when coasting around on light throttle, even though its 0-100 performance figures won't disturb a hot hatch. The 2.4-litre engine fares better, though its AWD drivetrain does take the top edge of its ability to nip up hills. The Sportage's diesel is light on its feet, even with the addition of the heavier AWD/eight-speed auto drivetrain. It's also impressively quiet, letting minimal road noise into the cabin. The suspension changes are small but meaningful, and it's the sum of a few small changes that make up the whole. This is not an offroad or 4x4 review; after all, the capability of a road-going SUV in brown dirt is minimal at best. Its ground clearance of 172mm, for example, is about 50mm less than that of a Subaru XV, and Kia doesn't even suggest a safe wading depth for the Sportage. Overall, the newly tweaked Sportage is a comfortable, stable and simple car to drive, with few of the compromises that sometimes come with a taller SUV. Three engine specifications are available across the Kia Sportage range – which, if a friend asks 'where is the Kia Sportage built? ', is made in Ulsan, South Korea. The base 2.0-litre MPI petrol engine in the Si and SLi has been retained, which is a bit of a surprise – we half expected a more modern direct-injection unit to be subbed in. The engine specs of the base 2.0-litre MPI petrol engine in the Si and SLi are starting to show their age. 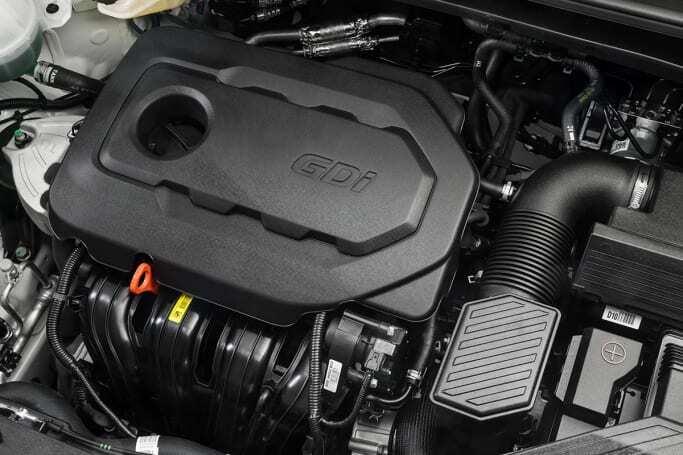 Kia's common rail direct injection 2.0-litre turbo diesel specs, meanwhile, are 136kW at 4000rpm, while its 400Nm of torque is available from as low as 1750rpm. Its horsepower is available across the range. 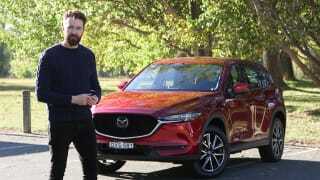 Its new eight-speed auto is linked to a front-biased all wheel drive system that can send 40 per cent of torque to the rear wheels for extra 4WD traction. The top grade GT-Line's engine size is a 2.4-litre four-cylinder petrol, and sports ratings of 135kW at 6000rpm and torque specs of 237Nm at 4000rpm. It uses a six-speed auto and is only available with AWD. It's not offered with an LPG conversion from the factory. The new eight-speed auto is linked to a front-biased all wheel drive system that can send 40 per cent of torque to the rear wheels for extra 4WD traction. Towing capacity of the 2.4-litre motor is 1500kg, the 2.0-litre petrol can tow 1600kg, while the diesel can move 1900kg of braked trailer; we will do a towing review soon, but it'll be fine with a small van or boat behind it. There is no manual transmission available. Curious about the diesel vs petrol sales breakdown? Kia Australia says the split is 35 per cent diesel, 65 per cent petrol. If you are wondering if the Kia Sportage uses a timing belt or chain, all variants of the engine use the latter. A chain is preferable to a timing belt as it gives a longer life. When it comes to diesel problems, clutch problems or transmission problems, the Sportage has been a good performer since the latest generation launched in 2016. A JD Power reliability rating study ranks it well, with few problems, complaints, issues or common faults. Check out our Kia Sportage problems page for more. Oil type and capacity varies with engine. All Kia Sportage models have a fuel tank capacity of 62 litres. From a claimed combined fuel economy figure of 7.9 litres per 100km, we saw a best combined fuel economy figure on the dash of 10.1L/100km over 100km in the 2.0-litre petrol Si Premium. Our diesel test, meanwhile, returned a best combined fuel economy mileage figure of 7.2L/100km over 150km, versus a claimed combined fuel consumption figure of 6.8L/100km. The 2.4-litre engine is claimed to return a combined fuel economy figure of 8.5L/100km. All Kia Sportage models have a fuel tank capacity of 62 litres, while the weight of the car varies between 1532kg for the 2.0-litre FWD, 1642kg for the 2.4-litre AWD and 1736kg for the AWD diesel. The base spec Si, Si Premium and SLi have all gained vital electronic safety features including auto emergency braking (AEB) with forward collision warning, lane keep assist which works with the steering to keep the Sportage in a lane, and downhill speed control. Blind spot detection, lane change assist, rear cross-traffic alert and automatic parking is available in the top-spec Sportage Platinum GT-Line. All Sportages also offer six airbags, including full-length curtain airbags, as well as front and rear parking sensors (rear only on Si) and a reversing camera. All cars also have full-sized spares. 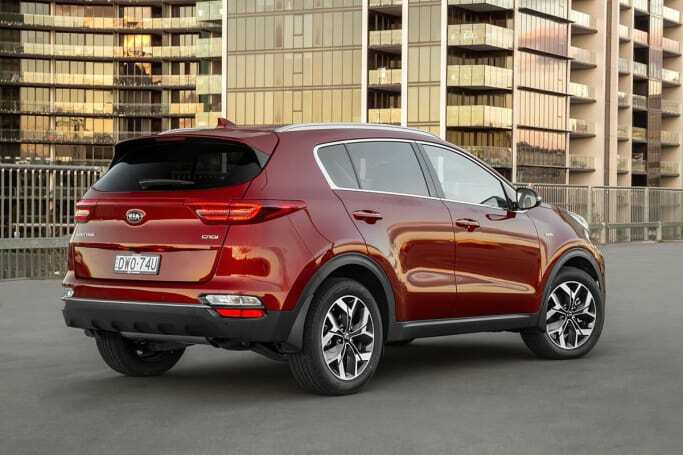 A 'variance submission' has been submitted to ANCAP for the updated Sportage, with Kia hoping to receive a top five-star safety rating from ANCAP. Kia's seven-year warranty is still among the best in the automotive business, and it includes roadside assist and a free first service at three months. Capped-price servicing covers the warranty period, as well, with $419 the lowest and $726 the highest service costs over four years for the diesel-powered cars, with a seven-year total of $3695; that's an average cost of $528 per service. Make sure your owner's manual gets ticked. The petrol engine program costs between $306 and $711 per service. The majority of services are under $400, with seven years of maintenance costs equalling an average of $420-ish, for a total of $2942. Resale value for most Korean brands is still not as good as some of their Japanese rivals; a 2015 Sportage Platinum diesel, for example, will have lost about 30 per cent of its new value if trading in, or about 12 per cent on a private sale. Waiting time on new cars is minimal, according to Kia. Kia's seven-year warranty is still among the best in the automotive business. 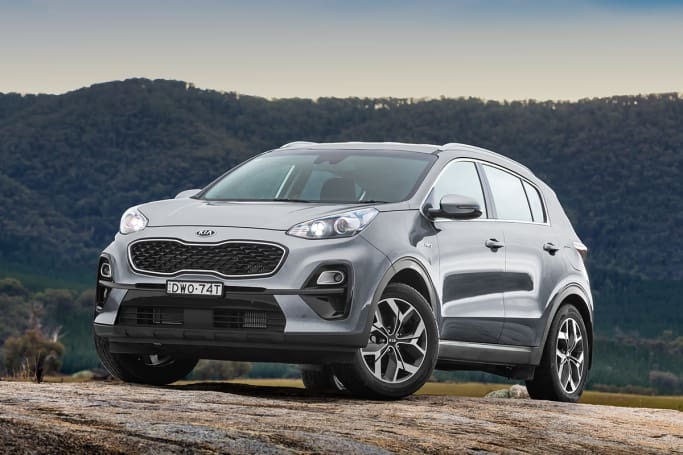 Key improvements to the Sportage have made Kia's second best seller even better again, with more safety and a nicer ride the net result. There are plenty of variants to choose from, too. Our pick is between the Si Premium in petrol or diesel - the AWD oiler is great if you have distance to cover, while the petrol powered car will be lighter and cheaper to maintain if you do your best work around town. Do the changes to the Kia Sportage for 2018 change your opinion of the car? Let us know in the comments below.